Immediate investments in infrastructure and a bipartisan National Infrastructure Bank, modernizing our roads, rail, airports and waterways while putting hundreds of thousands of workers back on the job. These investments in infrastructure would not only put people to work now, but also yield lasting benefits for the economy, increasing growth in the long run. 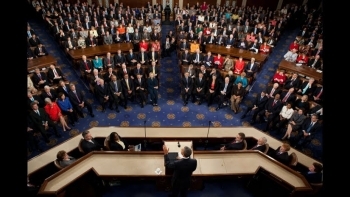 As AFL-CIO President Richard Trumka and U.S. Chamber of Commerce President Thomas Donohue stated: “With the U.S. Chamber of Commerce and the AFL-CIO standing together to support job creation, we hope that Democrats and Republicans in Congress will also join together to build America’s infrastructure.” (January 26, 2011). The president’s plan will invest $35 billion to prevent up to 280,000 teacher layoffs and keep police officers and firefighters on the job. On Oct. 6, a bi-partisan group of 23 mayors from cities across Ohio sent a letter to the Ohio Congressional delegation urging action on the American Jobs Act to put Ohioans back to work: The American Jobs Act provides funding to keep police officers and firefighters working. It will put Americans to work rehabbing distressed homes, small business, and schools. It helps employ people with a history of service, like veterans and teachers. The Act invests in cities by investing heavily in transportation infrastructure, building roads, bridges and trains. It also provides much needed assistance to the long-term unemployed, helping them end the frustrating process of searching for a job. And, the American Jobs Act create tax cuts to aass every American family. The plan follows the model in the bipartisan legislation from Senators Rockefeller and Hutchison in including an investment to develop and deploy a nationwide, interoperable wireless network for public safety. The plan includes reallocating the D Block for public safety (costing $3 billion) and $7 billion to support the deployment of this network and technological development to tailor the network to meet public safety requirements. This is part of a broader deficit-reducing wireless initiative that would free up public and private spectrum to enable the private sector to deploy high-speed wireless services to at least 98 percent of Americans, even those living in remote rural and farming communities. In addition, freeing up spectrum from the private sector through voluntary incentive auctions that were included in both the Rockefeller-Hutchison bill and the House-passed Budget would raise money to pay for these investments in public safety and also reduce the deficit. 112 economists signed a bipartisan letter supporting spectrum incenctive auctions, writing “giving the FCC the authority to implement incentive auctions with flexibility to design appropriate rules would increase social welfare." Drawing on the best ideas of both parties and the most innovative States, the president’s plan will equip the unemployment insurance (UI) system to better address our current long-term unemployment challenge. In these times, the federal emergency unemployment system must offer not just a weekly check, but also an aggressive strategy to connect the unemployed to work – through reforms ranging from rigorous assessment and job-search assistance to flexible work-based uses of federal UI to smart strategies to prevent layoffs in the first place. For example, the "Bridge to Work": A number of states have innovative programs that give workers the opportunity to take temporary, voluntary employment to keep up their skills and train at the workplace for a new job, while continuing to receive unemployment insurance. The president’s plan builds on what works in programs like Georgia Works or Opportunity North Carolina, while instituting important fixes and reforms that ensure minimum wage and fair labor protections are being enforced. This plan would authorize states to implement “Bridge to Work” programs to help connect the long-term unemployed to employers – through temporary work that allows employers to bring on potential new employees, helps the unemployed maintain or learn new skills, and on-ramps to hiring by allowing employers to subsidize the costs of developing newly employed workers’ skills. House Speaker John Boehner and Majority Leader Eric Cantor wrote to the president in support of this model. The president and the Republican leadership agree that Bridge to Work is an innovative approach to helping long-term unemployed Americans get back to work. Providing certainty to American families now that they will see a generous tax cut in their paychecks next year is a common sense idea that has enjoyed bipartisan support in the past.Last year, 139 House Democrats and 138 House Republicans voted together to reduce employee payroll taxes, as well as 43 Democratic Senators, and 37 Republican Senators. The leadership of both parties – Speaker Boehner, Minority Leader Pelosi, Majority Leader Reid, and Minority Leader McConnell – supported the December tax deal.